BOSTON -- As if his teammates screaming at him to finish off his epic fourth-quarter scoring performance wasn't enough, Isaiah Thomas looked into the crowd at TD Garden in the final minutes of Friday’s game against the Miami Heat to find his own mother screaming at him. "I looked in the stands, and my mom was like, 'Fifty! Fifty!' and I'm like, 'I'm trying!'" Thomas said. The 5-foot-9 Thomas set a Boston Celtics franchise record by scoring 29 fourth-quarter points and -- obeying his mother's command -- finished off a mesmerizing 52-point performance in Boston's 117-114 triumph over the Miami Heat. Only Larry Bird (60, 53) and Kevin McHale (56) have scored more points in franchise history in a regular-season game than Thomas, who is just the seventh player in team history to reach the 50-point plateau. Thomas tied Antoine Walker's franchise record with nine 3-pointers, six of which came in the final quarter. Thomas made 15 of 26 shots overall and all 13 of his free throw attempts over 37 minutes, 9 seconds. It was just 10 days ago that Thomas scored a career-high 44 points in an overtime win over the Memphis Grizzlies. Thomas eclipsed that mark with 1:57 to play, and both his teammates and his mother implored him to go for 50 -- or more. "It doesn't seem real, and they wanted me to keep going," Thomas said. "That's what's great about these teammates. They wanted me to get 50. Jae [Crowder] even wanted me to get 60. I don't know how I was going to do that, but it says a lot about those guys." Thomas was serenaded with MVP chants during every trip to the free throw line and simply seemed incapable of missing in the final frame. Thomas obliterated Boston's previous record of 24 points in a quarter held by Bird (1983) and Todd Day (1995). Thomas' 29 points were the second-highest fourth-quarter output in league history behind only Wilt Chamberlain, who scored 31 in his 100-point performance. After Thomas concluded a series of on-court interviews, which included Patriots running back (and Celtics superfan) LeGarrette Blount crashing the court to congratulate him, Thomas raced into Boston’s locker room where teammates were waiting with an ice bath to cool him off. Some of the shower hit his youngest son, Jaiden. Thomas' two sons warmed up by weaving their way through reporters to join their dad for his postgame meeting with the media. "Yeah, [the teammates] got me," Thomas said of the ice bath. "They got my youngest son, too. So he's over there freezing a little bit. They got me. That was the first time I've ever experienced that. That wasn't cool though. At all." Trying his best to muffle a smile, Thomas added, "I'm kind of mad about that." He also playfully scolded himself for finishing with zero assists. But on this night, the Celtics put the ball in Thomas’ hands and begged him to carry them at the end of a brutal December stretch. Boston was playing its sixth game in nine nights and on the tail end of a back-to-back after losing a national TV game in Cleveland on Thursday night. Thomas' 14-point second-quarter seemed like a monster outburst in an eyesore of a game. His fourth-quarter outburst turned a forgettable night into a historic one. Even as Miami rallied to make things interesting late, the Celtics were putting the ball in Thomas' hands and asking him to make big-time plays. This wasn't 52 points in garbage time. "I turned down shots on one possession," Crowder said. "We were all trying to free him. [Coach] Brad [Stevens] was doing a great job of calling plays for him off the ball. It was a team effort trying to get him the ball." 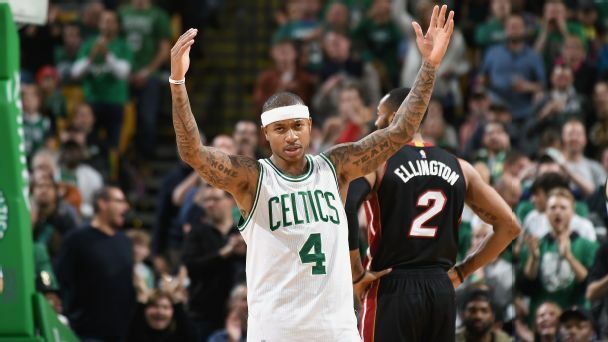 Isaiah Thomas was on fire against the Heat, dropping a career-high 52 points in a Celtics' win. Teammate Al Horford said he doesn’t normally look at stats during the game, but when Thomas got to the mid-40s, he wanted to help get him to 50. "[Thomas] just took over the game," Horford said. "We were struggling. Before the game he was like, 'We have to win this game. He was so determined.' He backed it up. He went out there and took over the game. Stevens pulled Thomas in the final seconds with the game secured in order to get him a roar from the home crowd. Thomas said Stevens joked that he was pulling Thomas for getting beat on a pair of back cuts. Thomas said the typically even-keeled Stevens did tell him, "good game," but Boston's coach offered much higher praise of the performance. "It was obviously an unbelievable effort to not only finish out a long month, but six games in nine days. Come back [from Cleveland], get in at 3 in the morning and go for 29 in the fourth. It's remarkable," Stevens said. "I mean, I don't know what else to say. It had nothing to do with coaching. That was an unbelievably willful performance. And we needed it." Thomas said he's scored 50 points in high school games but seemed a bit awed by doing it at the NBA level. "That fourth quarter -- it just felt like I was out there by myself, like I was in the gym working on my game and throwing up everything, and it was just going in. It was a special feeling," Thomas said. "For me, [scoring 50] feels normal, when I do score and I put the numbers up that I do. And I give credit to my teammates and this organization for believing in me, but it feels normal. Everything I've done my whole life I feel like I've worked that hard for, and it's never felt like I'm 5-foot-9 and I'm doing this. When I'm out there I feel like I'm 6-4 or just the same height as everybody else. Tonight was different, but everything else feels somewhat normal." After meeting with reporters, Thomas gathered his now-thawed children and headed for the exit. Celtics staffers had him autograph a couple of the box scores and, even if it felt normal, Thomas clutched a couple of the box scores on the way out to celebrate the not-so normal accomplishment.